Hi everyone! I’m still coughing from last month’s flu + sinusitis, so I STILL won’t be able to record a video this month – so sorry! But by the grace of the Goddess, I’m healed and well enough to present you the TAO of Kelly as an article. Thank you for your understanding! When this card appears, your potential for development in the areas of romance, creativity, and spirituality are at a high! The Tarot Pages represent the first stage of a new cycle in life. They could be ideas, messages/messengers, and sometimes literally children. The Page of Cups brings positive news that will make you fall in love with life all over again. This is a very tender, emotionally sensitive energy. The Page of Cups can also represent a person who is young or young at heart, caring, and helpful. This person could play a role in the outcome of events this month. If this isn’t someone in your life, then you’ll be the one who embodies the Page of Cups. Open your heart, lend a hand to someone who needs it, sing, connect with your Spirit team… and always, always let love lead the way. A FOR ANGEL: SPREAD YOUR WINGS! 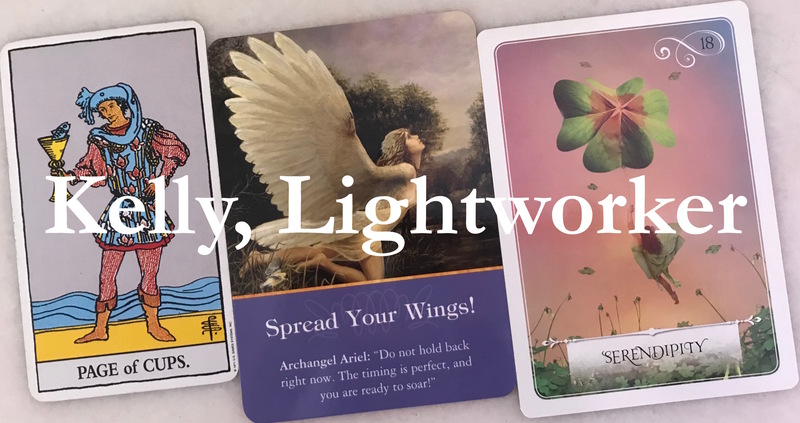 If you have been waiting for the right time to take a brave step forward in a relationship, career, hobby, or other pursuit, here’s your Angelic blessing to go forth and prosper. Be brave, and be blessed! In support of the other cards, the Oracle card Serendipity is here to assure us that when we move together with Spirit in the co-creation of our best lives and destinies, the Universe will make sure we know it: through signs, synchronicities, and jaw-dropping coincidences which prove to us that Spirit has our back, and is watching over us! And here’s the part where we need to take responsibility for ourselves. It’s one thing to go ahead with our plans and to seek Divine blessing for them, but we first need to make sure that our intentions are pure, and that we are working with the Universe to make things happen – not against Her. The Highest Light only ever wants our highest and greatest good. Whatever you do, or plan to do, make sure the Divine is on your side – and you, my friend, will be unstoppable. You’ll be living larger than life.